In these couple of weeks we have been talking marriage. Well, rather, God’s design for marriage. Yesterday we started to take a look at the reasons I believe God’s design for marriage is not working in today’s modern culture. Let me just clarify: There is not a problem with God’s design, there is a problem with lack of implementation of His design. The fourth reason I believe God’s design is not working in today’s culture can be traced all the way back to Adam and Eve. Yes, Adam and Eve, this is all your fault, all your fault! Before Eve was made, God gave the instructions regarding the forbidden fruit to Adam. It is my opinion that God entrusted the man to carry out His orders and, later, that he would make sure Eve did as well. Things would have probably worked out okay if we didn’t have an enemy. Yes, so many, even a lot of Christians, forget that we have a cunning enemy whose life is devoted to killing, stealing, and destroying. 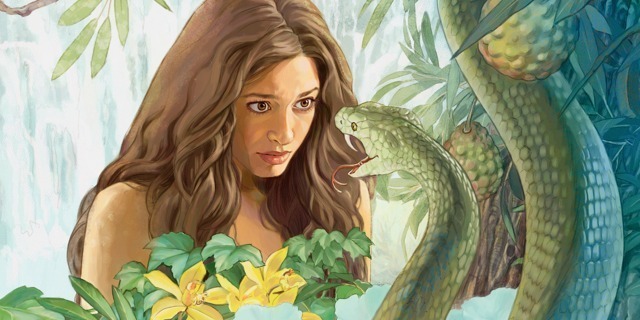 As we see in Genesis 3, Satan (the crafty little serpent) approaches not the man, but the woman. Furthermore, Adam is either not on the scene or he is standing by and doing nothing. Now, most of the commentaries and such that I have read say Adam was standing by, but I am not 100% sure, and I can’t determine how they can know for certainty. Anyway, he seems to be failing to protect Eve (and himself) from Satan and temptation. Then to add insult to injury, when God asks him what happened, he threw his wife under the bus, thereby, not taking responsibility yet again. “In all of this, the world witnesses the first spineless abdication of a man’s responsibility to love, serve, protect, and care for his wife” (David Platt, Counter Culture, 144). Now, Adam’s shortcomings do not mean that Eve was not responsible for her own actions. Adam clearly told her God’s instructions, as she repeated them to the serpent. So, she knew better, but she still fell to temptation. Here Eve was in the perfect Garden of Eden; she had all her wants and needs met. Then how is it she still fell to temptation? Because Satan is crafty and cunning, but he is also very simple. Sometimes it is the smallest stone that trips us. Here in that little statement/question…Satan plants his first seed of doubt. “Did God really say you would die?”…..”Is that really what God meant?” “Does the Bible really say…? You can see how Satan is still using this seed of doubt to trip us up. We , like Eve, want to be God. We want to be the god of our own lives. We want God’s word to match up with our own wants and desires. The consequences of both Adam and Eve’s fall to temptation are far-reaching. Tomorrow, we will rap of this mini-series by discussing said consequences and what it means for today’s marriages. Previous Previous post: Why Is God’s Design for Marriage Not Working?